One artist’s concept of Kuiper Belt object 2014 MU69, the next flyby target for NASA’s New Horizons mission. This binary concept is based on telescope observations made at Patagonia, Argentina, on July 17, 2017, when MU69 passed in front of a star. New Horizons theorize that it could be a single body with a large chunk taken out of it, or two bodies that are close together or even touching. Ground observations of the New Horizons spacecraft’s next target last month revealed the distant object, lurking in the outer Solar System more than four billion miles from Earth, might have an unconventional elongated shape, or even consist of two icy bodies orbiting one another in an age-old cosmic dance. The New Horizons team deployed 24 mobile telescopes to Chubut and Santa Cruz provinces in Argentina to catch the tiny world, officially named 2014 MU69, briefly blotting out light from a star. Called an occultation, the event helped scientists learn more about the robotic mission’s next target, including its size, shape, orbit and the environment around it. Two years after making the first close-up encounter with Pluto, NASA’s plutonium-powered New Horizons probe is speeding toward a flyby of 2014 MU69 on Jan. 1, 2019. A handful of detections from last month’s field campaign in Argentina improved scientists’ understanding of 2014 MU69’s shape. Researchers said the object could be a “extreme prolate spheroid” — akin to a skinny football — or a binary pair in which two bodies might be gravitationally locked close together, or even touching, according to NASA. Scientists have set an upper limit on the likely size of MU69 at 20 miles (30 kilometres) long. If there are two objects, each one is likely 9-12 miles (15-20 kilometres) in diameter, NASA said in a statement. Orbiting in the faraway Kuiper Belt, MU69 will become the most distant object ever visited by a spacecraft when New Horizons zips by on New Year’s Day 2019. NASA officials expect to give the target a new name before New Horizons makes its flyby at a relative velocity of more than 9 miles per second (14 kilometres per second). Miniature worlds like 2014 MU69 are likely the leftover ice and rock fragments that formed larger objects like Pluto, the moons of some Uranus and Neptune, and other dwarf planets in the outer solar system. The Kuiper Belt is a ring of ancient icy remnants from the earliest part of the solar system’s 4.6 billion-year history circling the sun beyond the orbit of Neptune. Its population includes continent-sized words like Pluto and the even-farther dwarf planet Eris, and perhaps hundreds of thousands of objects the size of 2014 MU69 or larger. A search by the Hubble Space Telescope discovered MU69 in 2014 after other surveys turned up no suitable targets for New Horizons following its encounter with Pluto on July 14, 2015. A series of thruster firings steered New Horizons on a new course for MU69 soon after the Pluto flyby. Observations by Hubble and the European Space Agency’s Gaia mission pinpointed MU69’s orbit, telling scientists when the object would pass in front of stars, casting shadows on Earth’s surface. Watching MU69’s passage between Earth and a distant star was a chance to learn more about the object than astronomers could ascertain from conventional observations. The tiny world appears as a fuzzy dot of light even through Hubble. An occultation visible June 3 from Argentina and South Africa was the first chance to study MU69’s shape and size. Scientists boarded NASA’s flying infrared astronomy observatory, called SOFIA, for a similar July 10 opportunity to search for debris around MU69 that could pose a hazard to New Horizons. MU69 blocked a brighter star July 17, giving scientists their best view of the object’s shape. While data are still being analysed, scientists probably will not know MU69’s true shape until New Horizons is on final approach in December 2018, Stern wrote in an email to Spaceflight Now. “These exciting and puzzling results have already been key for our mission planning, but also add to the mysteries surrounding this target leading into the New Horizons encounter with MU69, now less than 17 months away,” said Marc Buie, the New Horizons co-investigator who led the observation campaign. 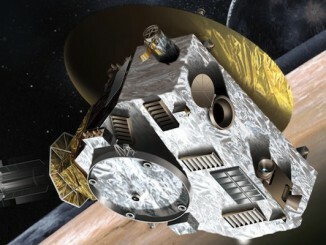 On the final stretch of a speedy nine-year trek through the solar system, NASA’s New Horizons spacecraft will be awakened from hibernation Dec. 6 for an encounter with Pluto, a mysterious world that has captured imaginations and will soon be revealed in reality. 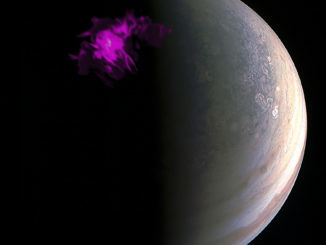 Jupiter’s intense northern and southern lights, or aurorae, behave independently of each other according to a new study using NASA’s Chandra X-ray and ESA’s XMM-Newton observatories. 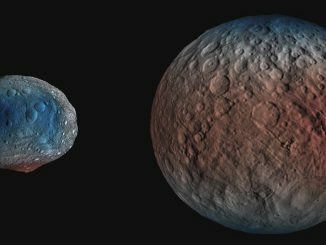 Scientists have long thought that Ceres may have a very weak, transient atmosphere, but mysteries lingered about its origin and why it’s not always present. Now, researchers suggest that this temporary atmosphere appears to be related to the behaviour of the Sun, rather than Ceres’ proximity to the Sun.